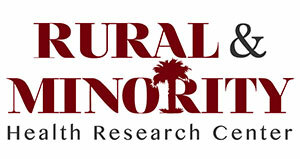 The Rural and Minority Health Research Center works to shed light on persistent inequities in health experienced by minority and low-income populations in the rural U.S. Center goals include developing the methods and conducting the research necessary to understand health status, healthcare needs, and health service use among vulnerable rural residents. The Center includes in its focus rural institutions, such as hospitals, community health centers, and rural health clinics, essential to the health of low-income and minority rural populations. The Center is based in the Arnold School of Public Health at the University of South Carolina.